Assembled with sensors aimed at detecting acoustic signals, and vibrations in general, in water, towed arrays are designed in order to minimize unwanted hydrodinamic noise. 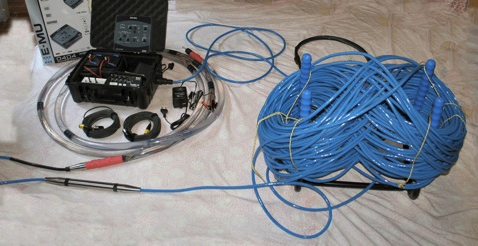 Towed hydrophone are usually made of more than one sensor, in order to receive information about the direction from where a signal arrives. Two main techniques are used to get this information: beamforming and time delay measure. While beamforming requires high processing capabilities and returns excellent results (and this usually means BIG computers and quite a lot of money), time delay measure is a rather simple but yet effective technique, requiring a simple PC and suitable software. We have archived on these pages images and ideas about arrays we have designed and assembled in the past. Hope they may be of some help if you are thinking about towed hydrophones for Marine Mammal research. 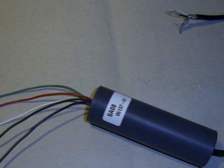 To fulfill many enquiries we have received, we have prototyped a "single element" towable hydrophone. 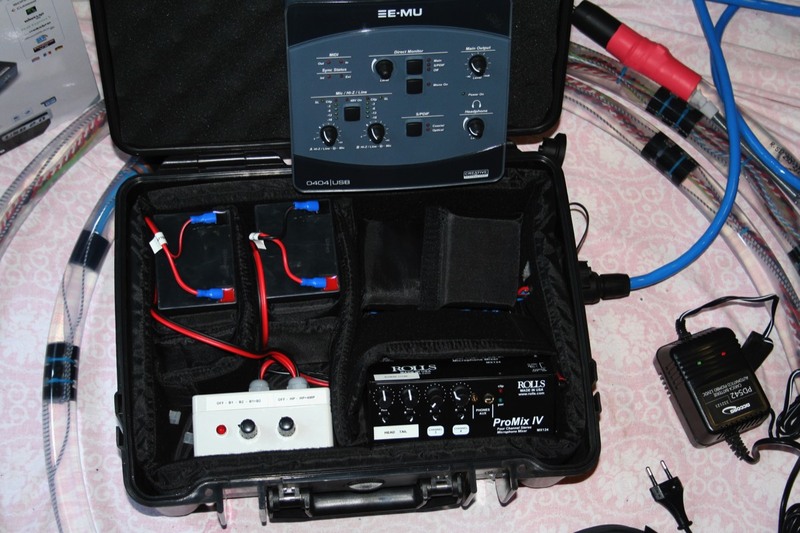 Assembled with a 50kHz sensor and low noise preamp electronics, powered via standard phantom power, using a long (more than 100 meters for towing) balanced signal transmission line (to guarantee reasonable immunity to electric noise), to be connected to anything with a standard professional MIC input. This system is aimed at helping "low-budget" researchers willing to get an underwater acoustic snapshot of the study area, operating from slowly moving sailing boats or from fixed coastal stations up to 500 meters from the listening point. 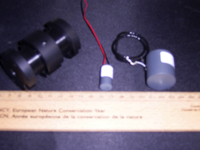 This hydrophone, codenamed FarONE, is branded by Nauta-rcs. 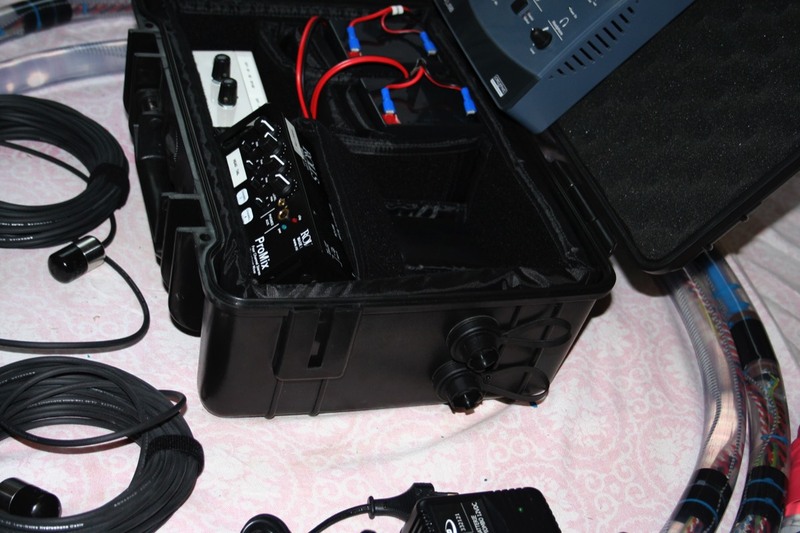 Based on the same sensors, manufactured in the UK, they differ in cable lenght (110m and 220m) and in additional features (a pair of extra hydrophones for stereo listening while free drifting, different plastic cases, different audio amplifiers). This is our standard setup for 2009/2010. 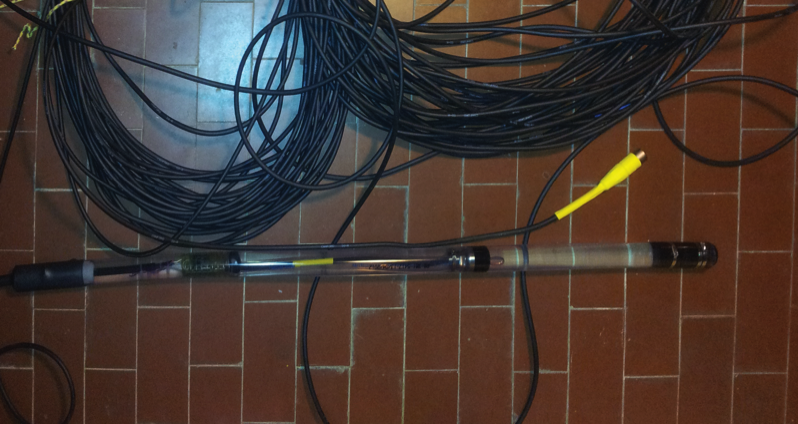 Codenamed G2, this was the less expensive towed hydrophone we have ever assembled. 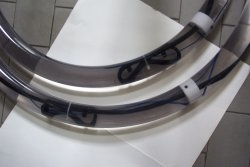 Maintenance was a pain in the neck, and finally we decided to cancel this product. After quite a long period of "tuning" with the customer, who required to change the wideband sensors with narrower band (and lower noise) ones, the worst problems came from the cable. 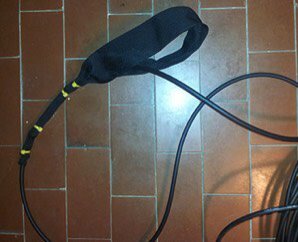 Lessons learnt: if you can not afford a good cable, but require durability, it could be better to give up your project and change plans. 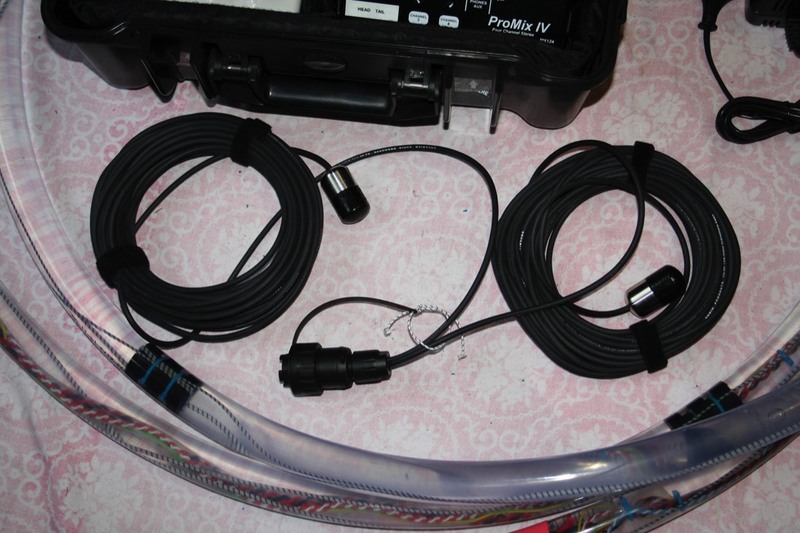 Codenamed PROTONE (PROTotype ONE), this was our test towed hydrophone. Do not even remember how many times we have changed the sensors on this. In 2008 it got entangled into a propeller and was lost. It had four sensors, and could be equipped with up to eight. One pressure gauge, and a nice modification to accomodate a temperature transmitter. Lessons learnt: on a prototype you will need more wires than how you have. 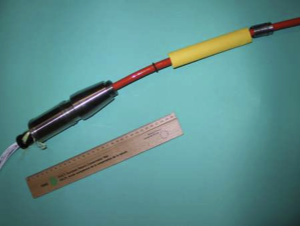 Codenamed G4 (generation four), was our standard commercial towed hydrophone in 2004/2005. Originally re-designed for a big NGO, this is our standard product at the time of writing. Analog part going from about 100Hz to 60kHz and then again from 100kHz to 230kHz, and a digital acquisition interface, with filters, going from 0Hz to 48kHz, offers an high frequency output, for click detectors. It is packed with software, and is worth the money! Lessons learnt: Let's provide training. Longer tow cable means lower noise and deeper sensor. 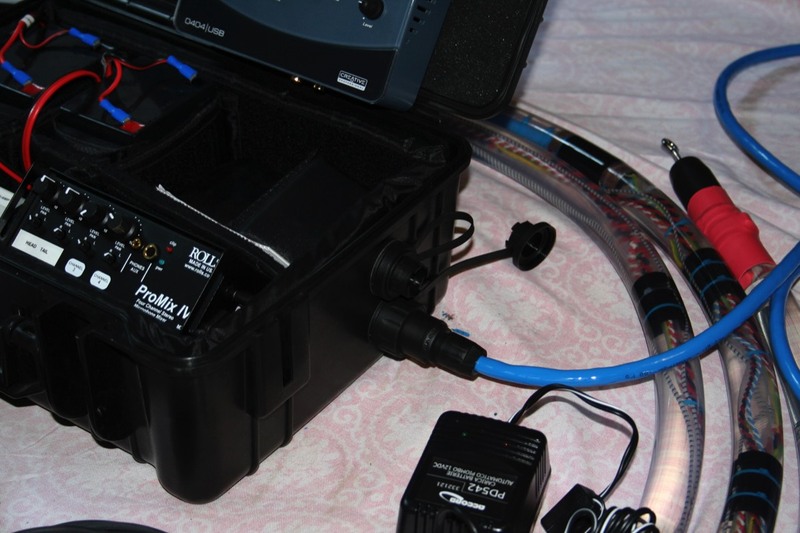 Where thermocline is an issue, you need deep sensors. G5 - TAOH. Year 2006. 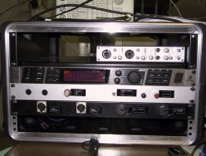 Manufactured with three elements (two wideband, high-pass filtered; one wideband, no filters), is our configuration for low budget systems during spring 2006. Here you can see the manual.